Ruou sim (wine made from sim fruit or Rose Myrtle) is popular with the many tourists visiting Phu Quoc Island as it delivers a fragrance and sour taste similar to cocktails. Ruou sim (wine made from sim fruit or Rose Myrtle) is popular with the many tourists visiting Phu Quoc Island as it delivers a fragrance and sour taste similar to cocktails. However, the man who made the beverage is completely unknown. Mac Van Nghiem was born in the Mekong Delta province of Vinh Long. He lived with his grandfather who helped inspire the young boy to make new varieties of drinks. His first two drinks were made from banana and glutinous rice. In 1945 his aunt’s husband, a fish sauce seller, took him to Phu Quoc to reunite him with his aunt but the man died of cholera in Ha Tien on the long voyage to the island. So the young Nghiem suffered a tough life without an adult’s protection as he had to work as a firstly a porter at a fish sauce factory and then as a fisherman. Then, he joined the revolution against the French and lived in the forest where he had gained a reputation for his talent of making wine from acerola fruits, banana and glutinous rice. After the war, he was head of the financial committee of Phu Quoc Island and retired in 1990. A chance meeting with an officer from HCMC who came to visit the island inspired him to try to make sim wine. The officer told Nghiem about a recipe on how to make this drink from ethnic minority people in the Central Highlands. After three months of experiments, the first batch of sim wine came out and received great response from Nghiem’s colleagues and friends. The wine, which is below 15% proof, is suitable for people of all ages. As the numbers of customers were rising to crazy levels, he decided to start a business out of making sim wine. He opened a factory and hired workers to speed up the capacity and to answer the high demands of customers. Nghiem used thousands of sim fruits annually. However, he was starting to suffer as other rivals imitated his wine and they registered for trade marks to lure customers. Finally, he received support from the chamber of economy and culture to acknowledge him as the creator of sim wine with the registration wine brand named Bay Gao. The wine’s name originates from a love of this wine so its taste delivers customers both the passion and honestly of the true love of one man. Last year, sim wine of Phu Quoc was voted into the Top 10 most unique wines in Vietnam by the Vietnam Record Books (Vietking). Nghiem is now 88 but he looks much younger. 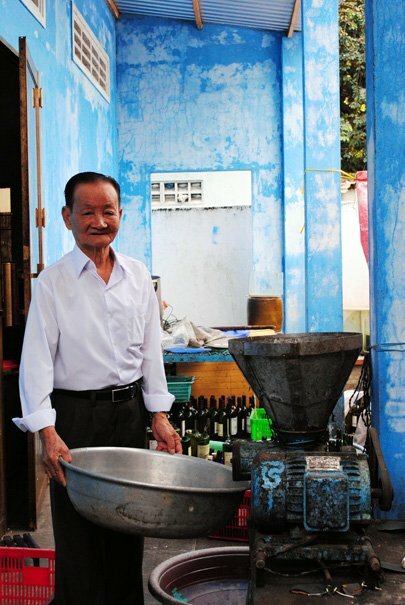 His youngest son has followed him into the sim wine business to preserve the family’s tradition and his father’s recipe. Apparently the area of sim forest may be narrowed down for construction, however Nghiem said that the local authority has plans to preserve this tree for many years and many factories on the island have planted more trees to maintain the survival of Phu Quoc’s sim wine.